THIS TOOL ALLOWS CROSS COMPARISON OF RESULT DATA FROM MULTIPLE EXPERIMENTS. CELLS ARE COLORED ACCORDING TO A HEAT MAP LEGEND, FACILITATING VISUAL IDENTIFICATION OF REGIONS OF STABILITY OR EXPOSURE. COLUMN SELECTION, SORTING, AND FORMATTING CAN BE ADJUSTED OR ORDERED ACCORDING TO SIMILARITY. PEPTIDES CAN BE REMOVED IF NOT PRESENT IN ALL EXPERIMENTS. RESULTS CAN BE EXPORTED FROM THIS VIEW IN TEXT OR GRAPHICAL FORMAT. 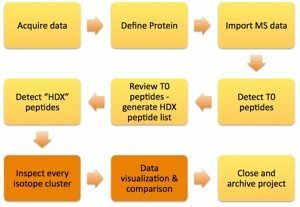 RIGHT CLICKING A PEPTIDE WILL LAUNCH STATISTICAL ANALYSIS FEATURES, IN WHICH THE USER MAY SELECT A REPRESENTATIVE TIME POINT AND THE RESULTS FROM ALL EXPERIMENTS FOR THE SELECTED PEPTIDE/TIMEPOINT COMBINATION WILL BE COMPARED FOR STATISTICAL SIGNIFICANCE USING ONE-WAY ANOVA AND TUKEY’S MULTIPLE COMPARISON.